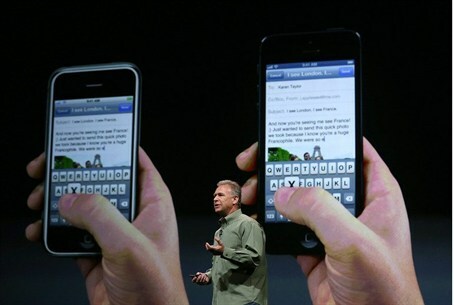 Apple introduced its new iPhone 5: A lighter, thinner and more powerful version of its iconic mobile device. Apple on Wednesday introduced its new iPhone 5, a lighter, thinner and more powerful version of its iconic mobile device. The company called the iPhone 5 “the thinnest smartphone in the world,” with an anodized aluminum body that is 18 percent thinner and 20 percent lighter than iPhone 4S. It features “diamond cut chamfered edges and glass inlays for a truly incredible fit and finish,” said an Apple statement quoted by AFP. Apple will start taking orders for the phone Friday and begin shipments September 21 in the U.S., Canada, Britain, France, Germany, Australia, Hong Kong, Singapore and Japan, AFP reported. The phone will be available in 100 countries by the end of the year. Pricing for U.S. customers will start at $199 with a two-year contract. Schiller said the new, taller iPhone features a new design to nestle in one's palm to naturally align with thumbs and works on the faster mobile Internet networks known as LTE. “When you carry your phone it should fit beautifully in your hand, that is just how we designed iPhone 5,” he said. “Everything you do looks gorgeous on this beautiful widescreen display,” he added, describing the so-called Retina high-definition four-inch (10-centimeter) display used on other Apple devices. The new device features Apple's own new A6 processor, which according to Schiller doubles the speed for loading Web graphics. Battery life, a key complaint of smartphone users, is extended to eight hours with mobile phone and browsing and 10 hours if Wi-Fi connections are used. Apple has also installed its own mapping software, upgraded its voice-activated assistant known as Siri and incorporated Facebook in the iOS software. Wednesday's launch event also unveiled a new lineup of music players including the iPod touch, which looks like an iPhone without mobile connections, and the iPod nano.